Click on the play arrow in the image BELOW to hear the song…. This fun animal song features our familiar cute Rainbows and Sunshine characters who are “Ten in the Bed” until each of the animals roll over and fall out. It’s a cute take on a children’s favourite and the music and sound effects encourage imagination and creativity in little listeners. The funny commentary from the animal characters adds extra humour and interest! Some of them are very cheeky! There are new and interesting versions of other traditional nursery rhymes and favourites such as “Twinkle, Twinkle Little Star”, “Incy Wincy Spider”, “Row Row Row Your Boat”, “The Wheels on the Bus”, and “Old MacDonald”, all with extra and original verses to stimulate the imagination. “The Grand Old Duke of York” has a marching style which describes, educates and demonstrates musically various instruments in an orchestra. Two dance and movement songs are very appealing to children aged 2 upwards – these are “Are You Ready?” and “The Alphabet Dance”. These songs are available individually and also as an album of 15 songs – 51 minutes of entertainment and learning with singalong songs, movement and dance, and many genres of music for variety. The album is called “Rainbows and Sunshine” and is available under the SONGS | SONG DOWNLOADS menu above, from our retailers or iTunes. 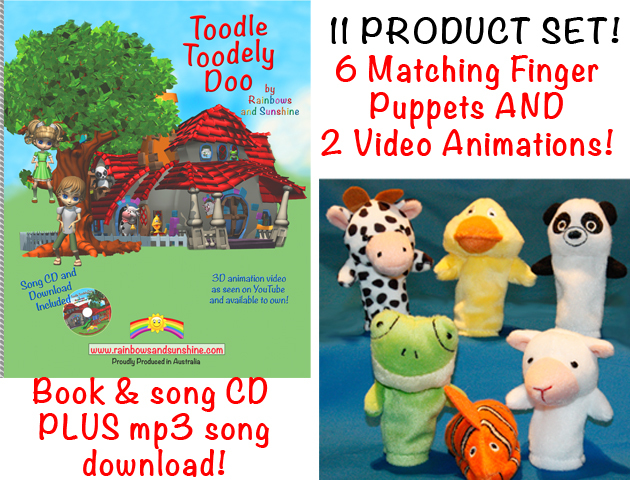 All the songs have an educational base and the website has suggestions and ideas for how to use these songs (and in fact all our products) to encourage development and learning. Additionally, many of the songs have matching 3D animated videos and even books and toys, making complete sets available! 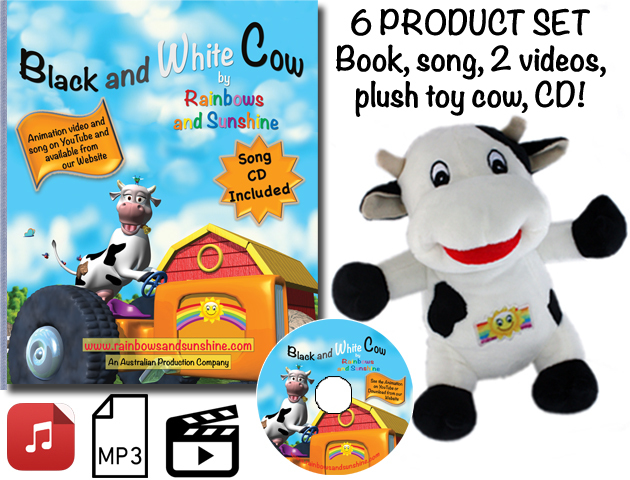 Check out “Black and White Cow” and “Toodle Toodely Doo” which are our signature complete sets. The books and songs are ideal for newborns upwards and the videos and toys can be introduced as parents wish – and they all match together!